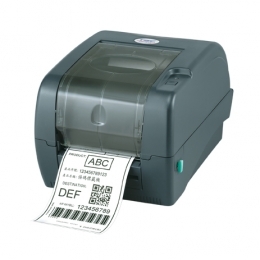 Within the double-walled housing of the thermal transfer printer TTP-247 from TSC you will discover powerful technology. Through its high resolution and sharp print image onto labels with 112 mm widths it delivers top-quality results. According to the requirement and demand, choose between the model with 8 dots/mm 203 dpi and the one with 12 dots/mm 300 dpi. The print speed of both models will impress you - 178 mm/sec. and 127 mm/sec., respectively. The printer command language of the TTP-247 is compatible with EPL and ZPL, which, together with the standard integrated USB, parallel and serial ports ensures for simple integration. Optionally there is also an Ethernet port available. With 8 MB SDRAM and 4 MB Flash it processes quickly and reliably. If you require more memory, expand its capacity via an SD card reader. Media change is easy, thanks to its practical clamshell design, plus it holds material up to 300 m long. By using two motors instead of one, it reduces noise and extends the printers life.